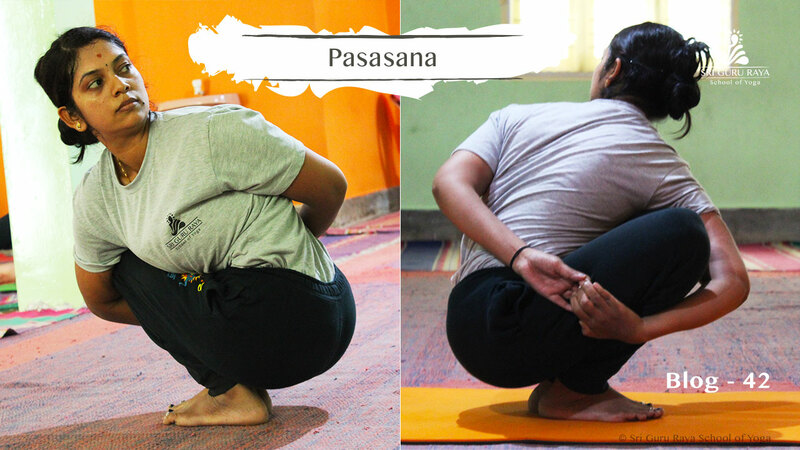 Pasasana is a posture in which the body is twisted, and the arms are bound around the squatting legs. The name comes from the Sanskrit pasa, meaning “noose,” “tie” or “snare,” and asana, which means “pose” or “posture.” It is so called because of the way the arms form a bound loop around the legs. Stretches groins, ankles, thighs and spine. Strengthens the spine, hips and ankles. Opens the shoulders and chest. Helps to stimulate the abdominal organs. It helps to improve the digestion and elimination of the waste material. It relieves the tension in the back, neck and shoulder. Regulates the Menstrual cycle and eliminates the discomfort. Great remedy for the mild back, shoulder and neck tension. Regular practice can cure asthma, flatulence and sciatica. Turn your head to the right and pull your shoulder blades backward such that they are towards each other. As you breathe, lift and lengthen your sternum through the top of your head. Avoid this asana if you have a herniated disk or injury in the lower back. Pregnant women and women during menstruation must not practice this asana.